Here is how you can help to save the whale populations. Large whales don't have many predators. The biggest threat is humans! While calves and sick individuals may sometimes be taken by sharks or killer whales, generally, they don't pose a threat to the large, healthy baleen whales. 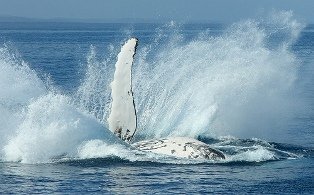 However whaling, particularly in the last century, cut whale numbers down by 90%. Another human-caused threat is water pollution which causes a huge amount of diseases and even death. Then there is noise from boats. Whales rely on a form of sonar to locate food and they use a variety of sounds to communicate with each other. Noise from boats and ships interfere, making survival even harder. A more recent threat to whales and dolphins is Naval sonar testing. There have been mass strandings of whales and dolphins after sonar testing has been conducted in the area. Even the Navy admits their sonar testing kills marine animals! I have been reading a book entitled, "War of the Whales: A True Story," by Joshua Horwitz. This well written book tells the story of what sonar testing is doing to these beautiful animals! One way to keep up on current whale news is to read my Whale News Page. We all need to work together if we want to make a difference!